2.5mm Stereo Plug to 3.5mm Stereo Socket Adapter. 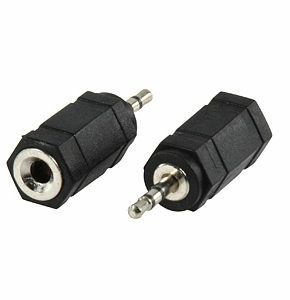 2.5mm stereo jack plug to 3.5mm stereo socket adapter. 2.5mm Male plug (stereo) to 3.5mm female socket (stereo). A scart adapter for converting a scart connector to 3 x phono (video + audio left & right) & s-video. The signal direction is set by an In/Out switch. All contacts are gold plated. Reverse Polarity SMA Female to SMA Male Adapter. Commonly used with wifi adapters this RPSMA Female to SMA male adapter is used to convert between SMA and reverse polarity SMA. Gold plated for optimum signal transfer. Single item supplied, picture shows both sides of adapter. 3.5mm Mono Jack Plug to Phono RCA Socket Adapter. 3.5mm male to phono female adapter high quality adapter. 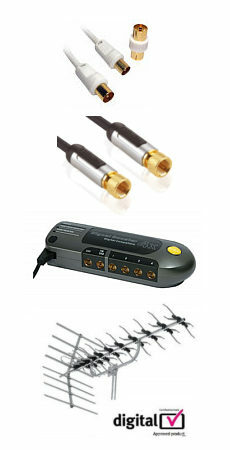 Commonly used on digital audio spdif connections to sound cards.